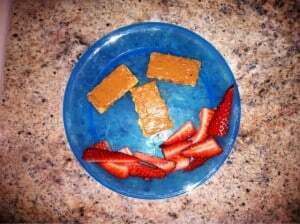 Sam’s snack today: peanut butter on graham crackers with sliced strawberries. Kids that dislike eating or have really limited diets can make even the most calm, planned meals into very stressful experiences. It won’t take long before the whole family dreads mealtime. This is a terrible cycle to get into, so if you can, avoid it. But, if you are in the midst of it, don’t worry there is hope! Kids don’t eat for a wide variety of reasons, everything from difficulty chewing to they don’t want to put down their Barbie. 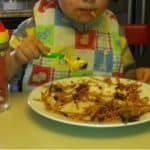 When the actual act of eating is difficult or uncomfortable, which it is for some children, eating can cause anxiety and thus makes them want to avoid it. In these instances, kids will often try stalling tactics before meals, or worse, tantrum. 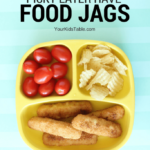 If getting your child to the table is a battle, and they are mad or crying by the time you get them there, it is pretty likely they are going to eat poorly or not at all anyways. Plus, you will be so spent that you will end up giving in to whatever just so they eat something. It is important to be addressing the root of the problem, if there is one. Sometimes, it has just become habit and a lack of routine that causes a rough start to the beginning of a meal. So, the first step is to get them to the table without any drama. Can you give a warning (ex: “Sara, 2 minutes to dinner.”), you may need to give several of these? Can you make reasonable accomodations (ex: “Do you want to eat on the patio instead?) Can you give choices (ex: “Do you want to sit in your booster or in your high chair?/Do you want to eat in the dining room or kitchen? etc.) Do you need to set a timer that they can see visually? Children respond well to knowing what comes next (aka having a routine/schedule) and feeling like they have a little control (aka giving them a choice). By implementing some of these strategies you may be able to start the meal off on the right foot. It will take some trial and error but keep trying you will find a balance. Also, think about what you are asking of your kid from their point of view. Is it a beautiful day and they have only had a few minutes to play outside before you are asking them to come in and eat? Could you serve the meal before going outside or have a picnic instead? Or maybe, your child has just gotten out of their car seat and doesn’t want to be confined in another space just yet… Can you give them 15 more minutes before expecting them to come to the table? I could go on and on with different scenarios, but the point is to try and think if you are asking too much of them in the moment they refuse to come to the table. Remember This: Keep mealtimes as positive as possible by planning ahead and heading off tantrums so your kid can have a positive association with eating! Look for part 2 in my series on Making Meals Positive!